is from the 1944-45 academic year and includes the Classes of '45 and '46. 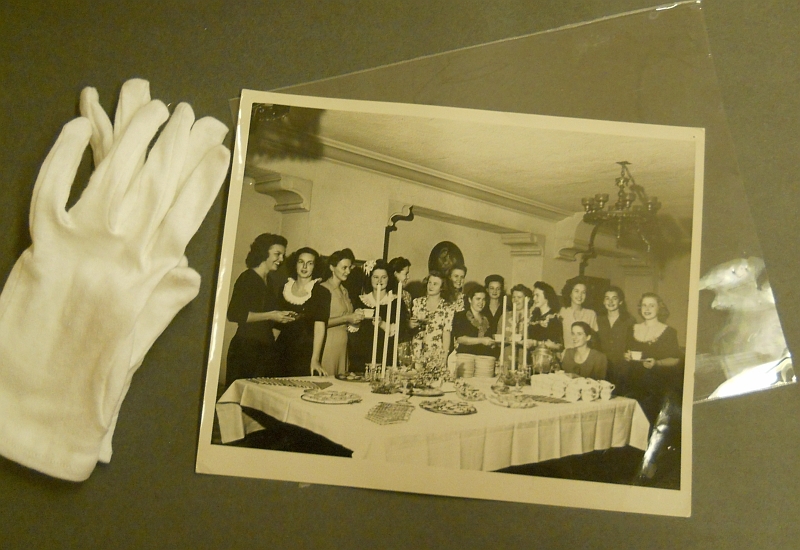 THE MOST POPULAR TREASURES in the College Archives – at least in terms of requests to use them – are the historic photographs. They exist in many forms, rich black and white prints, color snapshots, slides, color transparencies and for about the last 10 years, digital pictures in the form of JPEGs. They're a problem, which we'll get to in a minute. With a little TLC, the black and white prints will last for a really long time. They get the white-glove treatment to prevent fingerprints and a crystal-clear poly envelope that is as close to lasting "forever" as we talk about in the profession. 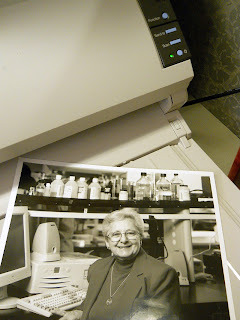 A 1994 photograph is ready for scanning. legendary Physical Sciences chair emerita. Slides, transparencies and other formats get their own special sleeves. If anyone needs to reproduce one of these historic images in a publication or brochure they go onto a scanner. The resulting JPEG can be sent virtually anywhere – with the proper copyright permissions. Unfortunately, you can't put JPEGs into a sleeve and talk in terms of forever. The best we can do to preserve the JPEGs is upload them our online repository and keep a couple of backup copies on external hard drives. And if worse comes to worst, we've still got the hard-copy originals to rescan. Our photo archives sort of come to a stop around 2003, the year College photographers switched from film cameras to digital. There are a few sets of snapshots, but the really good ones – professionally shot and processed - are elsewhere, or nowhere. If they're not in the archives, they can't be archived or preserved. Will we have today's student events to look at 70 years from now, as we do the tea party from 1945? Cross your fingers.